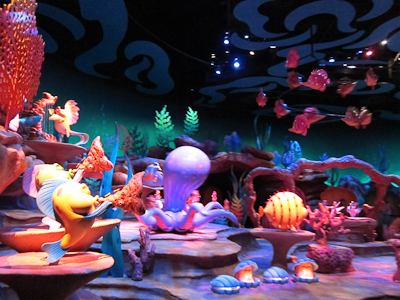 Anyway the Little Mermaid is over in CA Adventure but since it opens on June 3rd and I’m around for the annual passholder preview, I thought I’d go ahead and blog about it. 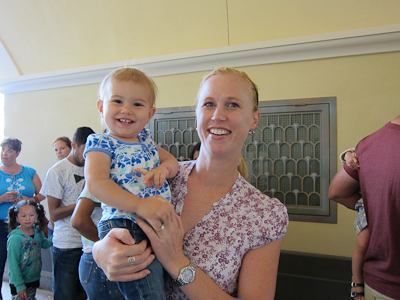 Today’s MYWTMouseketeers were Kristin and Audrey. Funny thing about the line. Kristin and I thought we’d get there right when the park opened. 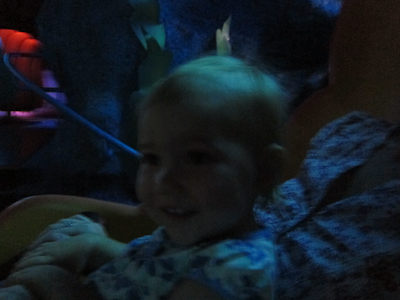 We met up at Theo’s preschool where her two older kids also go, then stopped at Subway and headed down to Disneyland. 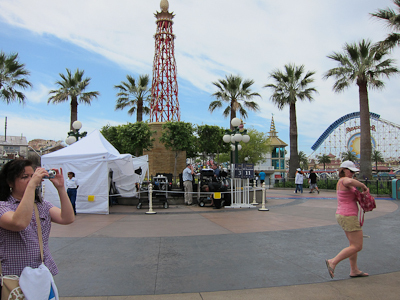 We got into DCA at about 10:05 (the park opened at 10) and there was already a nice long line. And naturally it was in a different location than last night’s line. No, I’m not going to draw you another map. It went back down to Grizzly River Rapids and then instead of going through Communist Russia you actually went across to the World of Color viewing area and zig-zagged there for a while. Then Kristin went back later in the afternoon with the rest of the family and said that the line was in a different location/configuration again. So like I said last night, who knows where the line will be when it’s your turn. The nice thing is that the cast members were really on top of keeping people in the proper location so there really wasn’t any confusion. 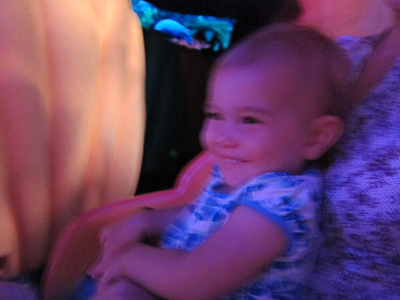 This morning it took us just about 35 minutes to get on the ride, so again while it does cover a lot of physical distance, it moves along pretty quickly. 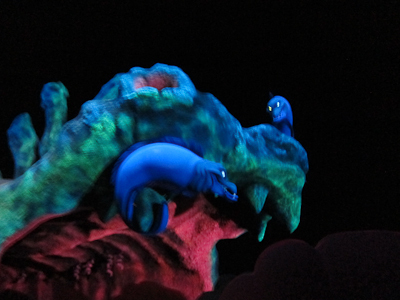 When you get into the dark room, you first meet Scuttle. 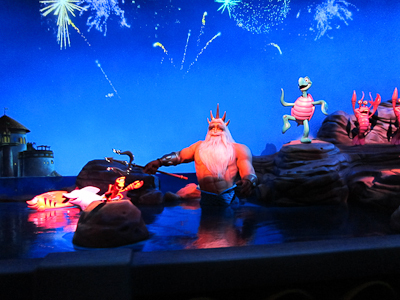 Scuttle starts telling you the story of the little mermaid, which is nothing like the original little mermaid story as written by Hans Christian Anderson. That version is seriously jacked up. As was Hans Christian Anderson himself. Weird dude. Did you know that he once stayed with Charles Dickens, and stuck around so long old Charles had to throw him out? True fact. Anyway, then you have a bubble effect like you’re going under water. This is all projection. Oh also, fair warning here, my photography is not the greatest. Anyway, Audrey REALLY loved the bubble effect. Isn't she adorable? Almost as adorable as Theo! 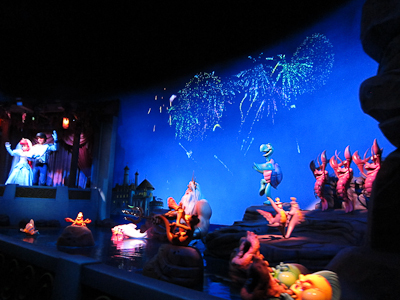 Then you look up and you see Ariel swimming around above you. 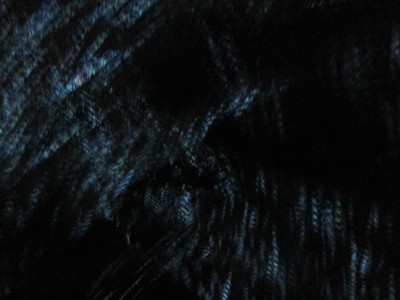 This is on a screen but looks super cool. 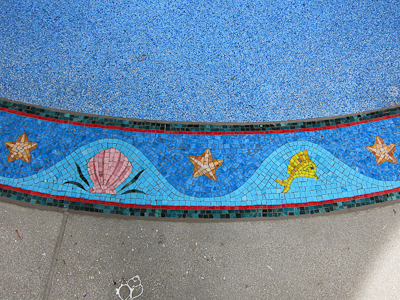 Then you see Ariel sitting amongst her treasures on the ocean floor. And also a glare from a bad camera angle. "I want to be where the people are"
If you time your photography right, you can get really awesome pictures like this one where the character is obscuring her own face! 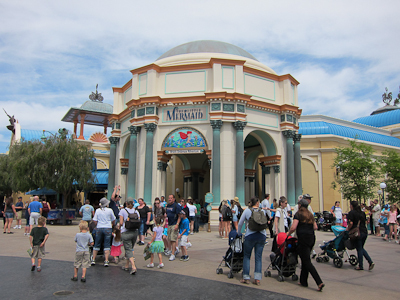 Then you go into the Big Room, that is really the centerpiece of the ride. It’s all “Under the Sea”ish and it’s like this giant piscene blowout. Tons of singing, dancing, and spinning around. 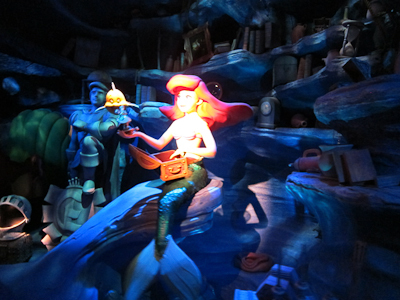 Then you round the corner and get to what I’m seeing called the Dole whip Ariel. That is, her hair looks like soft-serve ice cream. 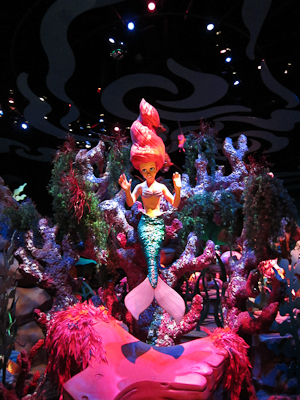 Apparently in the movie it’s fish swimming around her that do up her hair like that, but the ride leaves it out. Don't shoot! Bad hair is not a crime! 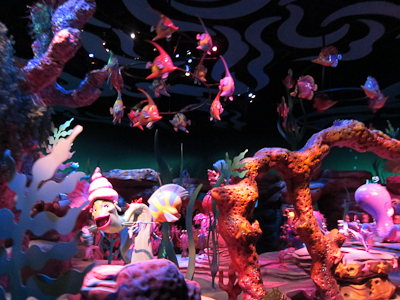 And you come back around for another view of all of the cool dancing and singing fishies. A fuzzy Audrey really dug this part too. 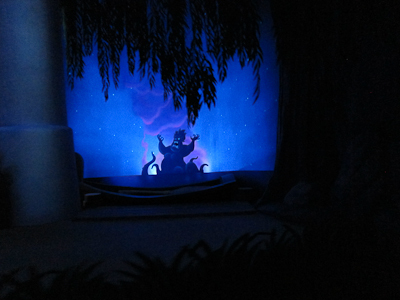 Following that, you approach Ursula’s Lair. 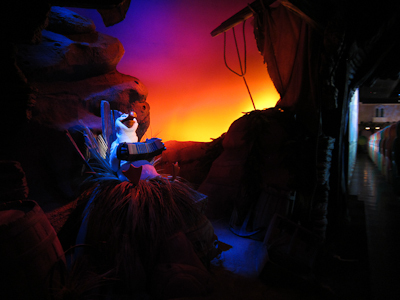 I think this is one of the best parts of the ride. 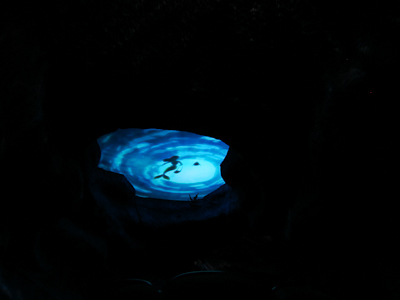 The animatronic Ursula is really well-done, and her crystal ball has moving images of Ariel, et al. 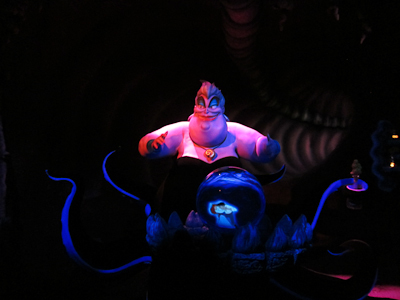 THERE'S Ursula! 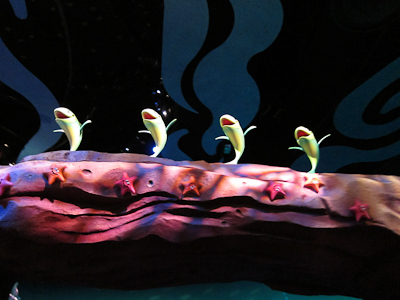 Poor unfortunate souls! Disney is very discreet. No wardrobe malfunctions here! Audrey liked this part too, but I didn't take a picture of her. 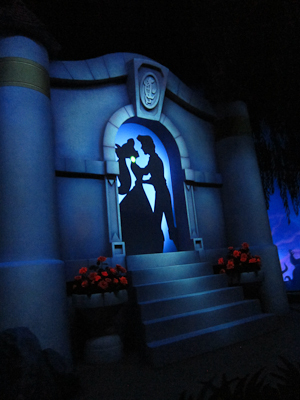 And then you get to another great scene–the Kiss the Girl scene. I really loved this part. It’s impossible not to sing along. Just kiss her already! The suspense is killing me! 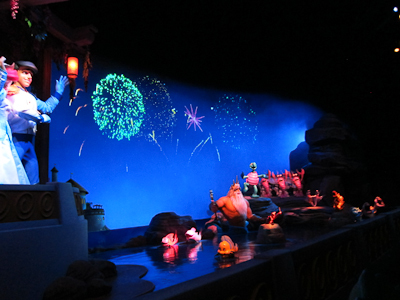 Then there’s the one place I think the Little Mermaid ride falls short. Here you expect Ursula to have her big confrontation and whatever that’s like 1/3 of the movie, but no, her entire fall from grace is relegated to a piece of plywood in the back. 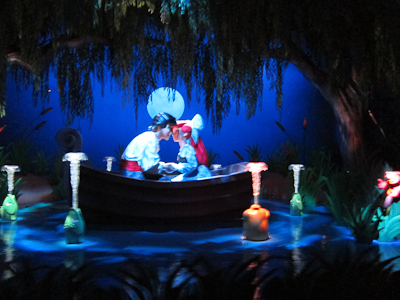 Because Ariel and Eric have finally kissed. 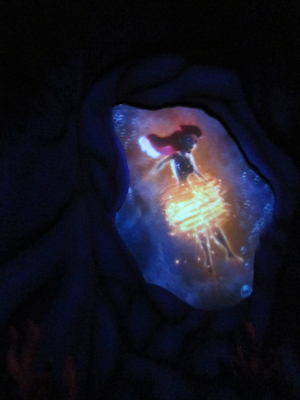 The glowing part in Ariel’s throat is her voice and it actually comes around and draws a cute heart around the two of them, but that was timed differently than my picture. 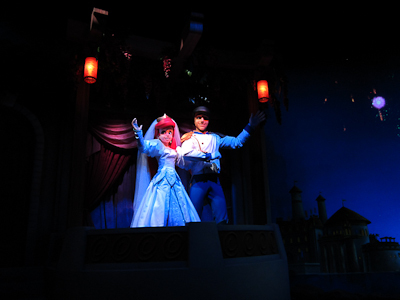 Then you move to the wedding scene, which is a big celebration! On the screen, I mean. Not like actual fire. And there’s the happy couple. Thank you so much for the toaster and the table settings! And your ride comes to an end. In the movie, there is a slightly unsettling part. 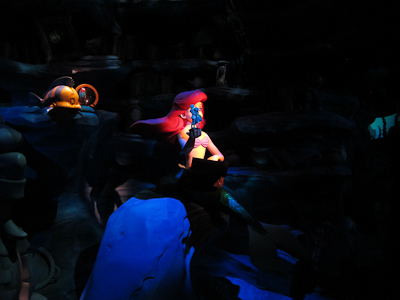 In the beginning of the movie, Ariel tells her father that she’s 16 now and should be allowed to get her driver’s license, or the mermaid swimming equivalent of her driver’s license. But then at the end of the movie she ends up married. At 16? Is this a good example to set for today’s young people? 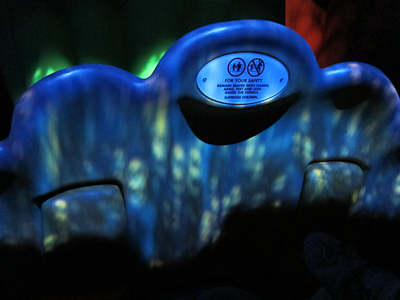 Anyway, I also grabbed a shot of the outside of the ride. And the media was lined up across the way for the big opening on the 3rd. I wanna be on television! Also, cool clouds! 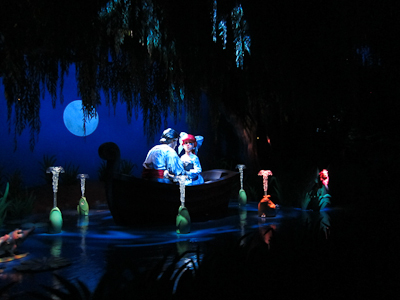 And there you have it–The Little Mermaid!!! You crack me up with your self-depracating photography comments. I feel your pain. I have an almost 6-year old and I’m still trying to get “THE” shot of him. Something ALWAYS goes wrong! Thanks for sharing the inside scope on the new ride! Trying to decide if it’s worth the way. Hmmmmm… you guys wanna meet us down here today (Thursday 6/2) it would be fun!!! It’s probably not worth the wait today, Mari. And Theo’s about to go down for his nap, but maybe I’ll text you later :). That was fun “non-productive preschool time” yesterday – I’m glad we were able to meet up with you! Yes, 100% non-fuzzy in real life ;). And in addition to being adorable, she is the sweetest, most good-tempered baby I’ve ever met. I may steal her. LOL! Shelby, maybe you can just borrow Annika for a bit instead?